Global airport information app flightSpeak has introduced a feature aimed at helping business and leisure air travelers at what is perhaps the most stressful point of their trip: getting through security. Named CheckPoint, the security wait time feature in flightSpeak’s Airport app provides estimated wait and screening times for security checkpoints at the top 100 busiest airports worldwide, including the 50 busiest in the U.S. Eventually, developers expect to expand it to include all the airports the app covers, which is more than 300 as of this writing. flightSpeak’s CheckPoint feature leverages a combination of flight volumes, weather information, and machine learning to improve wait time estimation accuracy, according to the company. In addition to its proprietary approach, the app enables passengers to upload their own security wait times, providing current and real-time estimates based on travelers’ real-world experiences. For a quick evaluation, I downloaded the app to my iPad and headed to Seattle-Tacoma International Airport (SEA). According to the app, the security wait time was between 10 and 20 minutes, as shown at right. 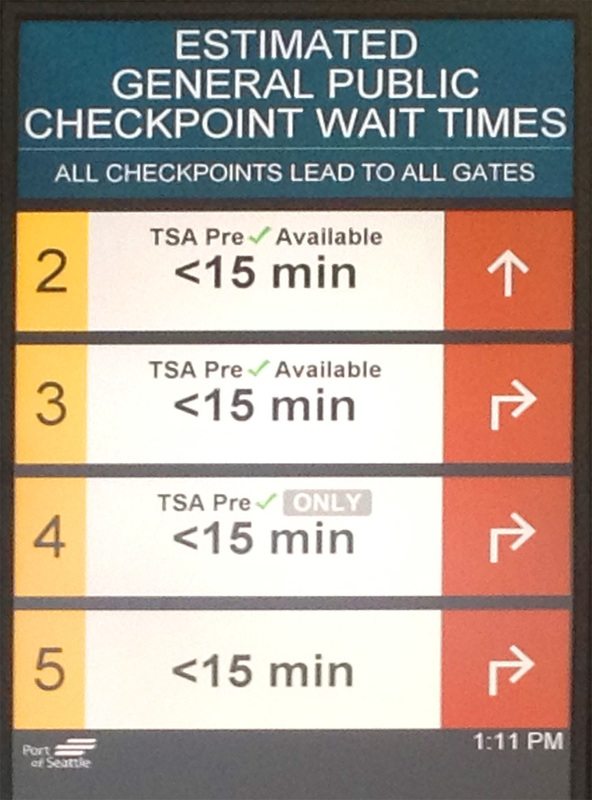 The reader boards recently installed at the airport, shown below, said the wait at each of the four open checkpoints was less than 15 minutes. So far, so good. However, as with many of the apps I have used and reviewed, this one needs a bit of fine-tuning. At Sea-Tac, the security checkpoints are simply numbered 1, 2, 3, 4 and 5 but the app calls them the Central, Charlie, FIS, North and South checkpoints. Because those names appear nowhere in the airport, passengers who rely upon the names listed by app may never find them. 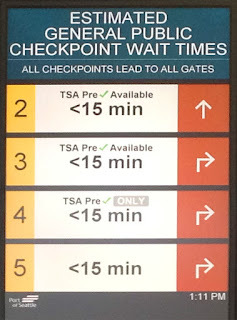 In addition, the app provides a single “Estimated Security Wait Time” and does not differentiate between premium security lines, TSA Pre-Check or general security. Developers tell TheTravelPro they are endeavoring to correct those issues. In addition to expected security wait times, flightSpeak provides other information for the airports it covers. 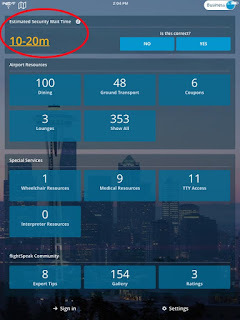 It lists Airport Resources, which include dining venues, lounges and ground transportation; Special Services including wheel chair providers, medical resources and TTY access; and access to the flightSpeak community where members offer “expert tips” on the airports they have come to know. As with any such app, its usefulness varies depending on the traveler’s familiarity with the airport and with the airport’s signage and other information. For example, signage at Sea-Tac is generally quite good. The reader boards listing security wait times by individual checkpoints are the latest addition to a broad array of information displays that list shops and stores, services and amenities. In contrast, other airports through which I have traveled have been less traveler-friendly. Although it has been a few years since my last visit, I recall Minneapolis-St. Paul International Airport (MSP) as being rather difficult to negotiate. A third-party perspective, such as the one provided by flightSpeak, could prove quite helpful in similar situations. flightSpeak is available for free on iOS and Android mobile devices. More information is available at www.flightSpeak.net.